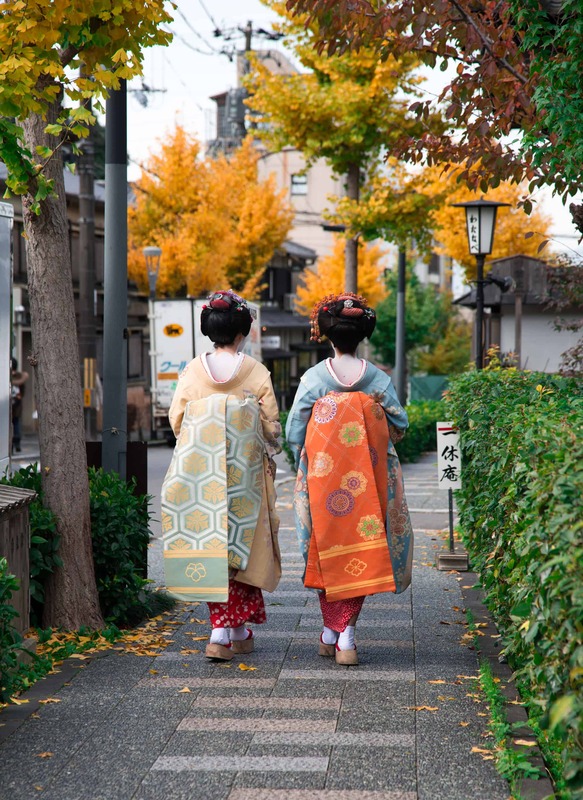 The vast majority of Kyoto’s gesiha live in the Gion district, an area filled with shops, restaurants and teahouses, where geiko and maiko (apprentices) entertain. They are artists who are held in very high esteem. They are entertainers who are not only hostesses, but also musicians, dancers and poets. Their services are expensive and exclusive, usually requiring an introduction via a referral, although some travel agencies and hotels have started creating packages, still it is very expensive. Geisha have a sorted history, people confuse them with earlier versions of courtesans, but the geisha emerged in the 1750-60’s as an occupation and were actually forbidden to provide sexual favors (they weren’t supposed to compete with the prostitutes) they were entertainers. 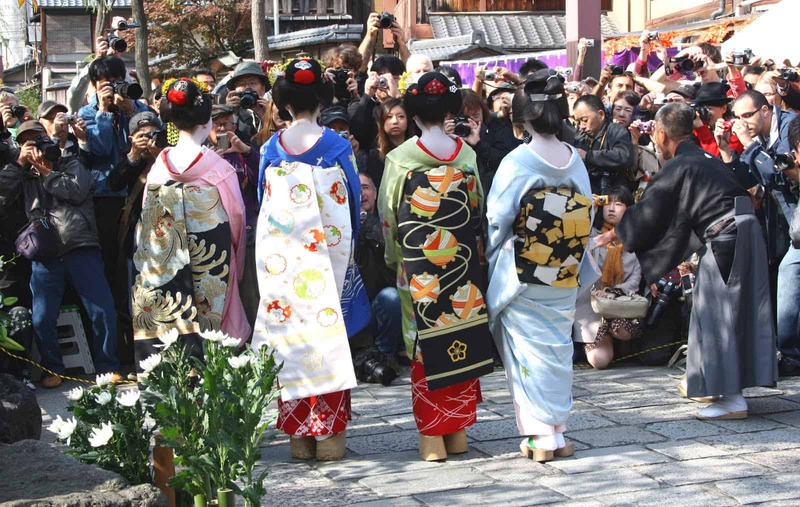 The world of the geisha has its roots in Kyoto where the imperial court was, but they are present in other parts of Japan (around 2000 in total), although Kyoto is where you will find the large majority (even is that is only a couple hundred). I had read so many stories about the paparazzi-style problems that the geisha have these days (like this NY Times piece), that Mr. Misadventures and I had no intention of “hunting” them down. In fact we barely stepped foot in Gion, just a few strolls as we were crossing into other neighborhoods. So we could not have been more surprised to come upon two geisha (the way to tell a geiko from a maiko is the lipstick [if you get close enough] red lips mean she is a full geisha, if only the lower lip is red, she’s a maiko) making their weekly offerings on a Thursday morning in the quiet neighborhood near the Kodaiji Temple. I had just shopped (ok, buying another scarf) at the most adorable little shop called Dot Dot when I spotted them across the street. I wanted to be as respectful as possible, I crossed the street (we were going to head that direction any way) and walked behind them heading to the temple. I was amazed to see how revered they are by the locals, bowing in respect as they passed. One Japanese woman spoke with them a moment and asked if she could take their photo with her phone. At that point I had passed them, but turned around to look at them and pointed to my camera, they smiled and gently nodded their head, I took a few photos (although they continued to look at the other woman) and bowed to them in thanks. I am not a good photographer, I am making baby steps, but I am really proud of the two photos I got because they were under pressure! How about you? Have you ever seen a geisha in real life? The pictures are beautiful! I have never seen a geisha in person. Thank you for sharing. Awesome story, thanks for sharing! Japan is definitely at the top of my travel list! So cool! I wonder what that’s like. 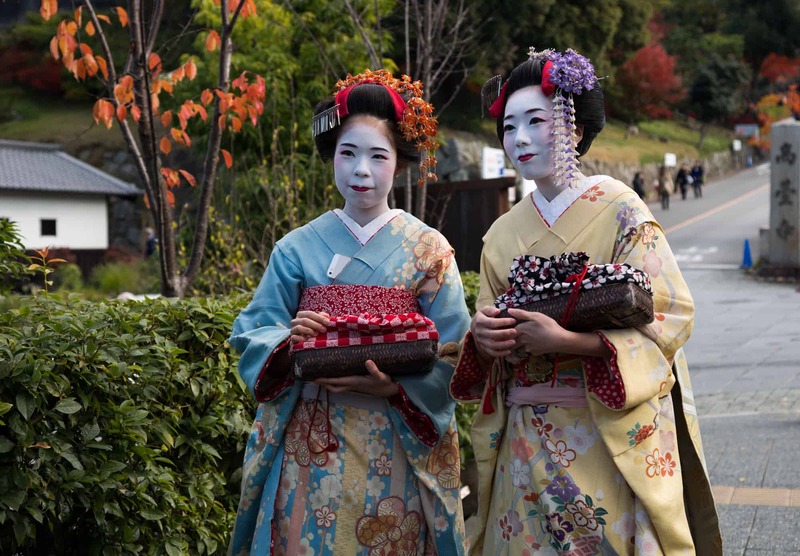 Everything I’ve seen about geishas seems exhausting and sad. But they are beautiful. @Candace, I would have to agree on the exhausting part, their schedule is incredibly rigorous, but they seem so calm and at at peace when you see them in person. Wow, the photos of the Geisha’s are so pretty. @Nancy, thanks, and as much as you like make-up I am sure you would love how complex their make-up routine is. @Natalie, there is tons of history around the geisha culture and I find it fascinating as well! Wow, what a neat experience! And you took such beautiful photos! @Carly, thanks, it is certainly easier with these beautiful subject matter. Oh my! I just can’t believe how beautiful and proud they look in their attire. @Chrissy, they are so graceful and gracious. Thanks for the sharing the background story. I had no idea the difference between a Geisha and a Maiko. @Amanda, it didn’t either before I went and saw them in person, so interesting. @Lavende, thanks I was so pleased to have encounter them as we were definitely not trying to go out of our way to bother them in their neighborhoods like so many others do. They are so incredibly graceful! Fabulous pictures, it’s great that you asked permission to take them too, a great respect of their culture. @Fi, thanks, I think that is important. Not always possible, but important to try nonetheless. They are amazing pictures! And thank you for the interesting facts about geishas! @Jessica, I was definitely shy about approaching them, also wanted to show respect and try to not act like “that” tourist. They are exceptionally beautiful. Your photos are so great! 🙂 And what an awesome experience!! Your pics turned out beautiful! We hope to visit someday to see for ourselves the beauty. @Kristine, I hope you get there soon! I dressed up as a geisha for halloween one year when I was little. It was one of my fav costumes!! The ladies are beautiful and the pics are amazing. Thank you for sharing this. Your images are beautiful! 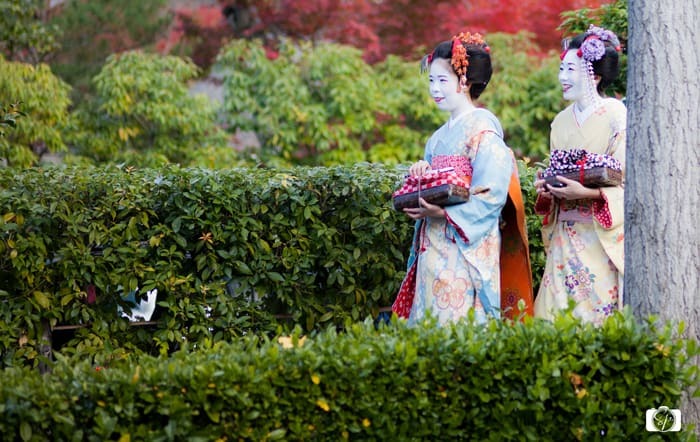 The Geishas are stunning as well! No I haven’t seen one, but I think my husband has. He spent 2 weeks in Japan when he was in the military. What an interesting experience! Their costumes are so beautiful and ornate! I’ve always admired the Geishas. They look like real life porcelain dolls. I have also always been amazed that they have no pimples with all that makeup on all the time! Wow, the beauty and artistry of come countries just simply amazes me. Thanks for sharing your experience with this wonderful culture! These women are stunning. I’ve always loved Japanese culture. I would love to meet a geisha. They are so gorgeous, aren’t they? Such a curiosity to me. I never knew that there was a difference geishas. I’m happy to leave with the take-away of knowing the difference by the lipstick. You’ve captured great images. Oh my gosh these are amazing photos that you got! What an amazing chance to run into these women. I love all of pictures, I had no idea about Geisha til found this, this is very interesting post. Geisha must be pronounced the same singular and plural, right? I do love your pictures! I’ll admit that I truly didn’t know what a geisha was (now I do). I just thought they looked cool! By the way, you took some really wonderful shots. I love hearing about other parts of the world. And your pictures are amazing. You did capture them at the perfect moment. What great photo’s, you really captured their beauty. Their clothing is amazing.